The Digital Microscope Eyepiece is an inexpensive way to upgrade just about any stereo and compound microscope into a Digital Microscope. 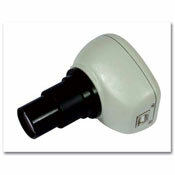 This combination digital camera with built in 10X eyepiece is a great way to preview live color digital images directly from your microscope onto your computer via the USB port. This camera comes with software to view, edit, and save images. A great way to share and email images.